Advisories are formal messages issued every six hours concerning tropical storms and hurricanes. They give warning information on where the storm is located, how intense it is, where it is moving and what precautions should be taken. The process where water vapour is transformed into liquid water. The transfer of heat or moisture in a medium by the movement of a mass or substance. When used to imply only upward vertical motion, it is then the opposite of subsidence. Apparent effect of the earth's rotation, tending to turn the direction of any object or fluid toward the right in the northern hemisphere and to the left in the southern hemisphere. The Coriolis Force gives a tropical cyclone its spin. Without it, tropical cyclones would not form. 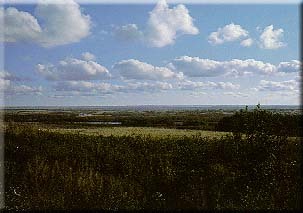 Heaped or lumpy clouds that form in an unstable atmosphere. A type of cloud that is exceptionally dense and vertically developed. These clouds appear as mountains or huge towers. 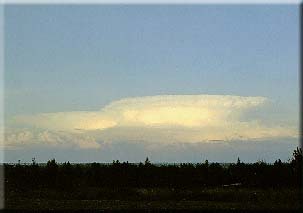 If they reach the top of the troposphere (as in the picture at right) the tops spread out and look like a blacksmith's anvil. They are more commonly known as thunderstorms. The temperature at which a vapour begins to condense. A sudden descent of cool or cold air to the ground, usually with precipitation, also associated with a thunderstorm or shower. The opposite of an updraft. The eye of the hurricane is the innermost portion of the storm. This zone is surprisingly calm with little or no wind. Within the eye, the skies are often clear, despite the fact that winds and clouds continue to rage around the edge of the eye. The eye is not always in the centre of the storm. Sometimes it turns or moves in various directions with the storm itself, which continues to move forward on its own course. Over the ocean the sea can be treacherous under the eye because high waves are converging. The ring of thunderstorms that surrounds a storm's eye. The heaviest rain, strongest winds and worst turbulence are normally in the eye wall. Any normally dry land area that is susceptible to being inundated by water from any natural source. This area is usually low land adjacent to a stream or lake. The expected severity of flooding (minor, moderate or major), as well as where and when the flooding will begin. Hurricanes are cyclones of tropical origin, with wind speeds of at least 118 kilometres per hour. 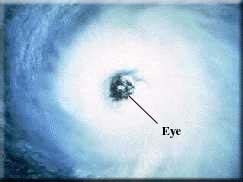 A hurricane is a large, rotating storm, where the winds move around a relatively calm centre called the 'eye'. These storms are known as 'typhoons' in the western Pacific, 'cyclones' in the Indian Ocean, and 'baguios' in the Philippines. Each storm usually has a life span of several days. 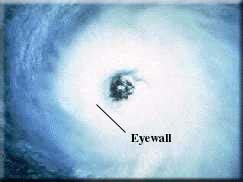 When the eye, or physical centre of the hurricane, reaches the coastline from the hurricane's approach over water. The portion of the year having relatively high incidence of hurricanes. North American hurricane season is normally from June to November. The most active month in Atlantic Canada is September. A hurricane warning is issued to coastal areas where winds of 118 kilometres per hour or higher are definitely expected to occur. A warning also may include coastal areas where dangerously high water or exceptionally high waves are predicted, even though the winds expected may be less than hurricane force. When the warning is issued, all precautions should be taken immediately. The warnings are seldom issued more than 24 hours in advance. If the hurricane path is unusual or erratic, the warnings may be issued only a few hours before the onset of hurricane conditions. As the hurricane continues to approach the mainland and is considered a threat to coastal and inland regions, meteorologists issue a hurricane watch for the regions in the calculated path. This watch does not mean that a hurricane is definitely going to strike. It means that everyone in the area covered by the alert should watch more carefully for the hurricane and be prepared to act quickly if definite warnings are issued that a hurricane will strike. A line drawn on a weather map connecting points of equal pressure. A measurement of wind speed. One knot = 1.853 kilometres per hour. Heat released or absorbed by a substance as it changes its state. When water vapour condenses into liquid, it releases this heat into the surrounding atmosphere. The atmosphere around this condensation then warms. Area which has a central pressure lower than its surroundings. Storm systems are all low pressure systems. The amount of precipitation appearing in surface streams, rivers, and lakes; defined as the depth to which a drainage area would be covered if all of the runoff for a given period of time were uniformly distributed over it. The scale used to give public safety officials an assessment of the potential wind and storm surge damage from a hurricane. Scale numbers are available to public safety officials when a hurricane is within 72 hours of landfall. Scale assessments are revised regularly as new observations are made. Public safety organizations are kept informed of new estimates of the hurricane's disaster potential. Scale numbers range from one to five. Bands of thunderstorms that wrap around a hurricane. The high and forceful dome of wind-driven waters, sweeping along the coastline near where the eye makes landfall or passes close to the coast. The configuration of a surface, including its relief and the position of its natural and man-made features. The generic term for the class of tropical weather systems, including tropical depressions, tropical storms and hurricanes. A tropical cyclone with maximum sustained surface winds less than 63 kilometres per hour. A tropical cyclone with maximum sustained surface winds 63 kilometres per hour to 117 kilometres per hour. A hurricane in the north Pacific, west of the International Date Line. A turbulent, convective state in the atmosphere resulting from a rapid decrease in air temperature with height above the ground. A small scale current of air with vertical motion. If there is enough moisture, then it may condense, forming a cumulus cloud and possibly thunderstorms. The opposite of a downdraft. The magnitude of wind change with height. Vertical wind shear can weaken or destroy the cyclone by interfering with the organization of deep convection around the cyclone centre.